And I’m obsessed with spelt. Like, seriously obsessed! As in I’ve gone through 3 packages of spelt in less than 3 weeks obsessed! A while ago I came across this NY Times article on Ancient Grains and got really curious about one I had never heard of before: spelt. So I went to the grocery store and got myself a big bag. After a little googling on how to cook it properly, I had a pot of cooked spelt that I then proceeded to use in all sorts of salads (and sometimes even eat it pure by the spoonful). 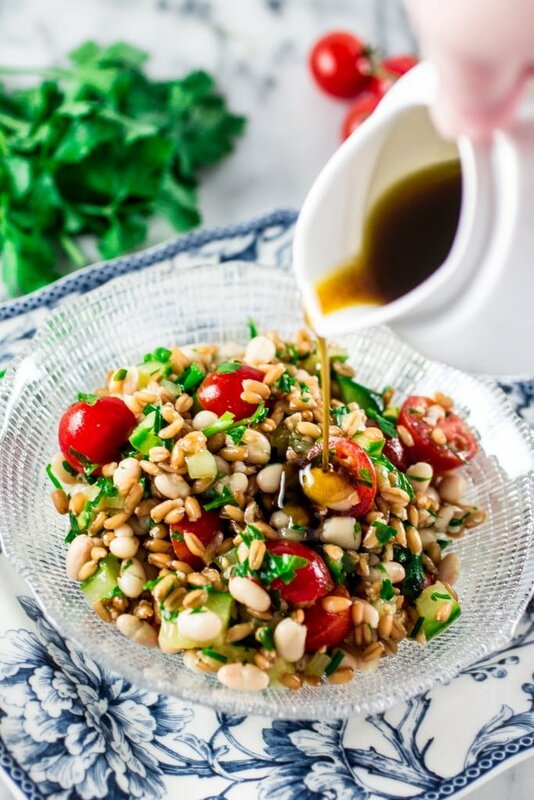 My favorite way to use it was in this Spelt Salad with Navy Beans, Cherry Tomatoes and Cucumber. 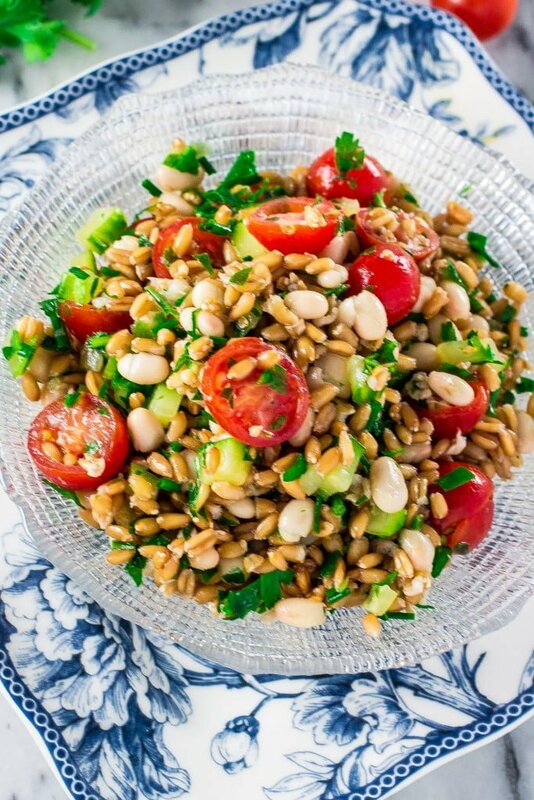 This salad is so refreshing and really benefits from the chewiness and nuttiness from the spelt. Not to mention it is packed with fiber and protein, which makes it a meal by itself and great for Meatless Monday! As you all know, I’m no vegetarian – just look at the last 3 posts on my blog – but I do like to cook vegetarian meals and I’m a huge grain fan. I seriously can’t wait to expand my use of spelt in things other than salad. I’ve read it is great in meatballs (where its starchiness works as a binder), risottos, porridges and pilaf! And as for using beans in salads, that is a recent trend for me. I grew up eating my beans hot, along with white rice. It was later in life that I fell in love with Black-Eyed Pea Salad, which inspired me to start adding beans. It is indeed a great way to boost any type of salad, really. Also, once the spelt is cooked, this salad is made in less than 5 minutes! I don’t know about you, but this is all I want for Spring and Summer. Low maintenance recipes that are still bursting with flavor and nutrients. All I wanna do is pack this salad, put it in my picnic basket and go enjoy it at the park or anywhere outdoors! Wanna join? Packed with fibers and protein, this salad is refreshing and full of flavor! 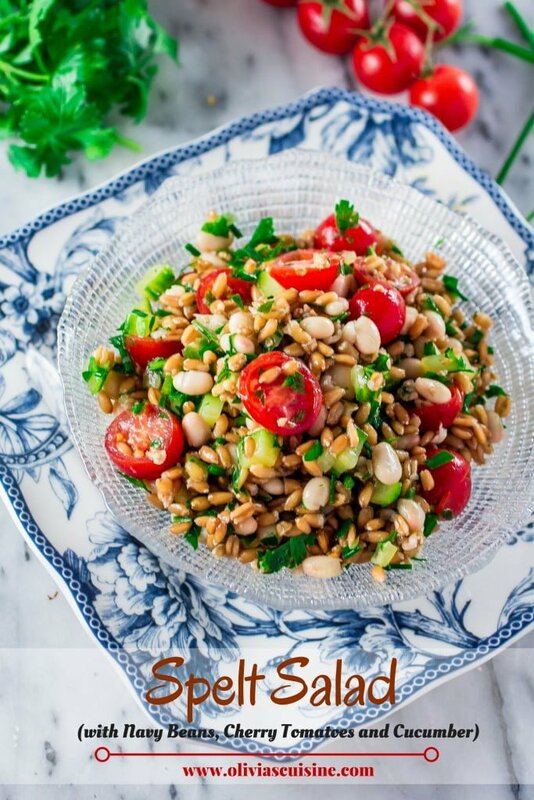 Substitute the spelt for farro or even wheat berries if you have trouble finding spelt! In a medium saucepan, over medium high heat, cook the spelt grains, a pinch of salt and the water until it boils. Reduce the heat to low, cover, and let it simmer for 45 minutes to 1 hour or until the spelt is tender. Drain, transfer to a large bowl and set it aside to cool. You could also add a dash of olive oil for flavor. 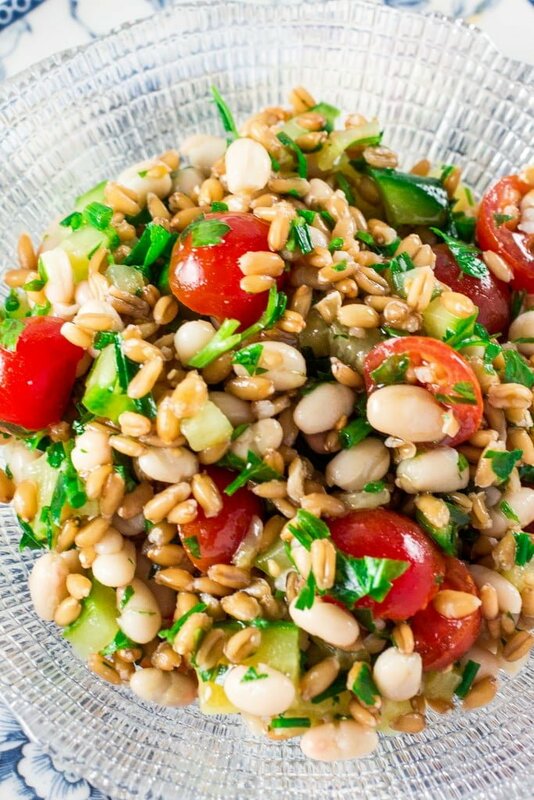 Once the spelt is cool, add the navy beans, the tomatoes, the cucumber and the herbs and toss to combine. In a separate bowl, combine the balsamic vinegar, the salt and pepper and the olive oil. Whisk until emulsified. When ready to serve, pour the dressing over the salad and toss to coat. You can make this salad one day ahead and refrigerate overnight. This looks so delicious and fresh. Looking forward to trying it! What a pretty salad, Olivia! I’ve never tried spelt before, so you’re definitely convincing me to do that. Love the flavors in here! I have never tried spelt, I really need to because this looks so yummy and flavorful! Perfect salad for your next summer! We are going to winter time here in Brazil but I really love grains and beans, so I’ll make it any way! I just can’t live without healthy salads like this one! Love it! Need to experiment with spelt more! I love healthy salads. I don’t think I even wait for season! But, yes, you are right, it’s official salad season now and I loved this colorful plate! Never used spelt in salads before! pinning to try later. Okay! You’ve convinced me! It’s time to try spelt! I love the look of this salad! I love how you use so many unique ingredients all the time. I will need to try spelt soon! Can I use spelt flour in this recipe?